Garage Door Repair Gloucester - From £41.99 inc VAT. Lifetime Guarantee. Why Garage Door Rescue in Gloucester? We are your local specialist garage door repair expert in Gloucester! We take pride in providing a fast, friendly service and we provide a written quote before we start any repairs, so there are no surprises. No repair is too big or too small for us at Garage Door Rescue. Our Garage Door Rescue engineers have had years of training in repairing and installing garage doors both past and present and they all live locally in the Gloucester area so we can get to you the same day if you have an emergency repair. Customer loyalty has played a major role in the success of our family run company over the last 20 years, so leave it to the experts to provide you with great value and top quality, reliable service. Satisfaction is guaranteed for all our garage door repairs in Gloucester. Our cable replacements come with a Lifetime Guarantee offering you complete peace of mind when we have completed your repair. We also provide a full 12-month guarantee, including parts and labour for all other repairs. All our repairs strictly adhere to manufacturer’s instructions so you are safe in the knowledge that your garage door will be in good working order for years to come. What kind of repairs do you provide in Gloucester? Our fully trained Garage Door Technicians can visit you to complete a full health check on your garage door, frame and automation system. As part of this service, they will give you a detailed report including a breakdown of any potential costs and parts that are needed so you will see how our total price is broken down. As your local Garage Door Specialist in Gloucester, we can offer you very competitive prices on the services we offer. We are very proud of the work we do and the high-quality service we provide to all our customers in and around the Gloucester area. 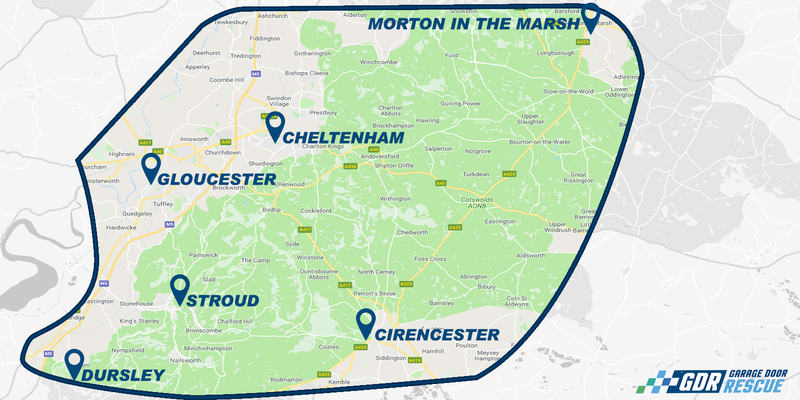 Unlike most of the national companies, our garage door engineers live locally in Gloucester so we can get to you quickly if your garage door has broken or is unsafe. Our customers like the service we provide too, but don’t just take our word for it – read our local reviews here. For Garage Door Repairs in Gloucester – Think Garage Door Rescue!